6 Level Long Span Industrial & Commercial Widespan Steel Shelving: Our Industrial Long Span Shelving is made from iron phosphate treated materials which is then painted with a baked on enamel. To determine the actual opening of our wide span shelving please deduct the post width from the bay opening to determine the true clearance. Units grow 1/2" both ways plus 1/4" growth for end to end or back to back units. Rated capacities of these units assume the use of F/A Braces: 1 for 48", 54" and 60" length and three for 69", 72", 84" and 96" lengths. Level rating capacities are based on the longest beam on the level. If you need long span shelving made in a custom size please contact us and we will be happy to work up a quote for you. This type of shelving can also be easily converted in to tire racks. 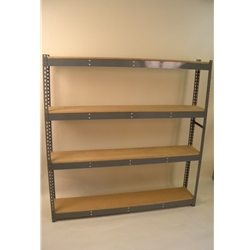 We currently carry wide span shelving with anywhere from 3 to 6 levels. The following sizes are available: 36x12x84 to 36x36x84, 42x12x84 to 42x42x84, 48x12x84 to 48x48x84, 60x12x84 to 60x48x84, 69x12x84 to 69x48x84, 72x12x84 to 72x48x84, 84x12x84 to 84x48x84, 96x12x84 to 96x48x84. Decking is not included in the listed prices. If you require wood for your long span shelving please let us know when you place the order and we can give you a quote for the shelving plus the wood to deck it. Long span shelving can be used as a tire rack. If you are looking for a tire rack and need some special dimensions please contact us with your specifications and we will be happy to work up a price on a tire rack built to suit your requirements. *Please choose the appropriate size before ordering.